The original Web Bar-Straps. Swing with confidence. Swing hard knowing that you will not rip off the bar. 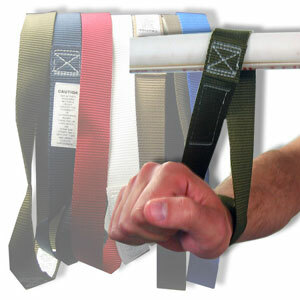 These bar straps are sold in a group of eight pairs of different sized straps, color coded to the size. Your gymnasts will find the size they need quickly and be up on the bar doing big swings before you can say GIANT SWINGS. Tumble Belts: Adjustable Tumble Belt 28" - 42"